Right about now I’m guessing you have a giant crate of blueberries sitting in your fridge, just waiting to be used. I have solutions! You could put them in a salad. You could eat them straight from the bowl. My vote: Make them into pie bars! These pie bars are are simple, requiring just 10 ingredients (which are flexible based on preference and dietary needs). And they deliver big tart-sweet flavor. Be stoked. For a closer look at how they’re made, check out the recipe VIDEO below (or right here). While you’re there be sure to subscribe to our YouTube channel to catch our latest videos right as they’re published. These bars were a special request from my friend Arleigh, who tested nearly all of our 31 Meals recipes and was my gorgeous photo assistant for this Grilled Corn Salsa, these Gluten Free Green Tea Crepes, and this Marriage Saver Mango Smoothie. What a pal. The least I could do was make her these bars – a dessert she’s long loved and asked me to recreate with a healthier twist. Make these for friends, BBQs, dinner parties, or just to use up all that beautiful summer produce. And if you do, be sure to leave a comment, rate it, and tag a picture #minimalistbaker on Instagram so we can see. Cheers friends! Simple, 10-ingredient Blueberry Pie Bars with a cookie crust, slivered-almond coating, and 2-ingredient glaze! The perfect easy summertime dessert. Lightly grease an 8x8-inch baking dish (adjust number/size of pan if altering batch size), or line with parchment paper. Alternatively, line with foil, but still add a bit of non-stick spray or vegan butter to ease serving. For the crust, add softened butter and sugar to a mixing bowl and beat until light and fluffy in texture - 1 minute. Add flour and salt with mixer on low and mix until combined - it should be crumbly. Add almond milk and mix once more - it should form a cohesive dough. If not, add a bit (1-2 tsp) more almond milk. Transfer dough to prepared 8x8-inch baking dish and dust the surface with flour. Use your hands to press the dough into the dish until flat and uniform. Chill in the freezer for 15 minutes, then preheat oven to 350 degrees F (176 C). Bake crust for 20-25 minutes, or until golden brown on edges and light golden brown in the center - you want it fairly well done. Let cool, but leave the oven on. In the meantime, prepare filling. Add all filling ingredients except almonds to a small saucepan over medium heat. Vegan butter and chia seeds are optional (to add flavor, richness, and thickness). Cook, stirring/mashing the berries, for about 6-8 minutes or until the filling is bubbly and resembles pourable blueberry jam. Remove from heat and pour over the baked crust. Top with slivered almonds and bake for another 24-28 minutes, or until filling is bubbly along the edges and almonds are slightly golden brown. Let cool completely - about 2-3 hours (or overnight) before serving. Before serving, prepare glaze by adding organic icing sugar to a mixing bowl. Slowly whisk as you add in almond milk 1 Tbsp at a time until a semi-thick, pourable glaze is formed. Once bars are cooled, drizzle with glaze (optional), loosen the edges with a knife and slice into 9 even bars (amount as original recipe is written // adjust if altering batch size). Serve with a spatula. The first bar can be a bit tricky to get out, so be gentle. Leftovers keep covered in the refrigerator for 3-4 days, though best when enjoyed within the first 24 hours. *To speed softening time, cut butter into 1/4 inch slices. *I haven’t tested this recipe with anything other than vegan butter, but you could try coconut oil (as I'm sure people will ask). In that case, I recommend using refined coconut oil at a “spoonable” texture rather than liquid. However, I can’t guarantee the outcome using this ingredient. *I have not tested this recipe with gluten-free flours. But if you try it, let me know how it goes! *Crust adapted from Ina Garten. *Recipe inspired by my friend Arleigh. Loosely adapted from Everything Nothing Wonderful. *Prep time includes chilling and cooling. *Nutrition information is a rough estimate calculated with almonds and glaze. These were quick, easy and delicious! I used frozen blueberries and added a splash of vanilla after removing them from the heat. Will definitely make these again. Hi Lynn! Well-integrated or unified? Hope this helps! This is a fantastic recipe, thank you very much! Made it vegan with coconut oil and added a tsp of cinnamon to the berries but other than that I followed it exactly and it disappeared in the blink of an eye ? I have this in the oven right now looks amazing. Can i freeze some? And if so whats the best way to serve after (just let earm up to room temp..?) Want to bring some to my mom but wont see her right away. Tx u! Hi! We haven’t tried it, let us know if you do! Saw my mom & gave her the frozen ones! Said it was just like eating it fresh! I think i need to make more this wk! Tx you, everything you make is out of this world. It takes a lot of pressure off “what should i make for dinner tonight” i just try your latest recipie or flip open your cookbook & choose. You are hands down the BEST. ? Delicious! These pleased everyone in the group (including those who eat dairy and gluten). I substituted Bob’s Red Mill Gluten-Free flour and regular butter. Worked out great. What vegan butter do you use? Does it have palm oil in it? Earth Balance works well, but use any vegan butter you have access to! I made these for a dourth of july BBQ and thet turned out amazing. Thank you so much for the recipe! I just made these with (Krusteaz) gluten free flour, unsweetened vanilla almond milk (it’s what I had on hand) and blackberries (we have a massive blackberry bush in our garden), and they turned out delicious. I did increase the sugar a little when making the filling, because the blackberries were a little tart. Next time I’ll add more sliced almonds on top. I just made these with (Krusteaz) gluten free flour, and I used unsweetened vanilla almond milk (it’s what I had on hand) and they turned out delicious. Next time I’ll add more sliced almonds on top. I went blueberry picking today and had a ton of fresh blueberries & in so glad I found this recipe! So so yummy! Though I had to use regular butter as I couldn’t find vegan butter in my area, but everything else I followed the recipe to the tee. Came out wonderful! I love this video. This dish is so yummy. Absolutely fantastic. I will rate it a 5 star for your enormous efforts, Dana. You make such a delicious food. Your blog is so interesting and very informative. i will let know my friends as well. Hi Dana! Could I use normal unsalted butter for this recipe? Also, for the crust, can I use brown sugar instead? I can’t wait to make it! That should work! Let me know how it goes! We are really Really appreciate your Blog. Thanks for sharing this delicious food. I made a trial pan to taste before making them for the bookclub women. The trial was delicious! Thank you, I will make them for the bookclub next week. Another fantastic recipe – Looks are SO delicious. We are really Really appreciate your blog post. This is very interesting blog. Thanks for sharing this with us. I made these with mulberries from my tree (free) instead of spending about $20 on blueberries which is how much it would be where I live >_< it was a bit sweet for me, but still delicious and my whole family loved it so much they went for 2nd and 3rds! These look amazing. I’m going to give them ago without the sugar & perhaps less blueberries, trying really low carb & keep everything Paleo at the moment. Any suggestions for a sugar replacement to keep them sweet? Looks Delicious, Will be trying it soon. Could you tell me if I could make this two weeks in advance and freeze it? These are SO delicious, just made them today. the crust in particular is super good. Another fantastic recipe – it was easy, delicious, enjoyed by the whole family (most of whom are not vegan)! I did sub coconut oil for the “vegan butter” and that worked perfectly well. Can you remember if you used the refined spoonable coconut oil recommended or the one that is liquid at room temperature? Jeaneliz, I used the regular coconut oil from the supermarket that is liquid or very soft at room temperature (depending on the temperature of your room!). Thank you very much for replying! I’m making these today, can’t wait ? Hi! Do you think frozen blueberries would work okay? Unfortunately not blueberry season right now but I want to make these for my hubby’s birthday tonight :) Thanks! Could I use real butter instead of vegan butter? There isn’t vegan butter at the grocery store in my town unfortunely. 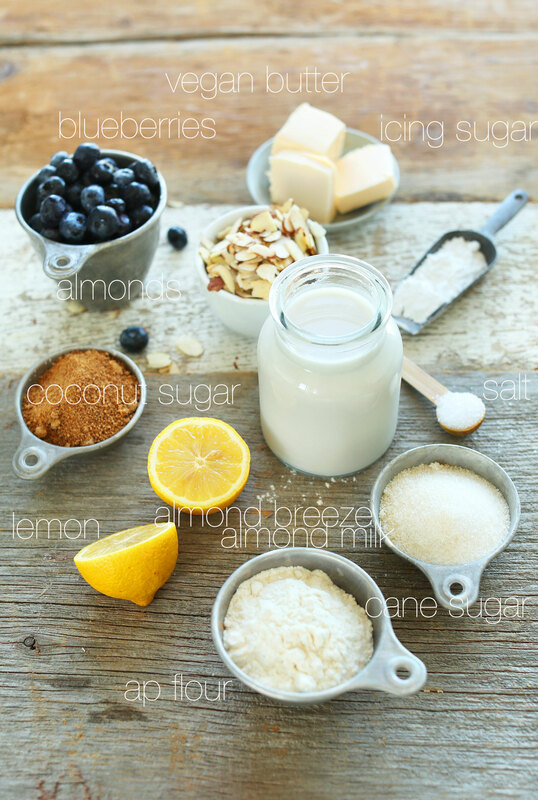 Almond + Lemon + Blueberry… Yummy! Looks like a very interesting combination of ingredients. I will definitely try this! I really wish that the bit about having loads of blueberries lying around was true…. I made these almost immediately after they were posted. Luckily I had all of the ingredients except the almonds so instead I used the crumb topping from the Deep Dish Apple Crumble Pie recipe. I also used coconut sugar only. LOVE LOVE LOVE! Can’t wait to make these again! This recipe was perfect! Used 1/2 cup of melted coconut oil in place of the the 1 cup butter (it’s currently very hot here and I don’t have vegan butter). Also used frozen blueberries that I had from blueberry picking. Added the optional 1 tbsp of chia seeds to the filling. Omitted the almonds and glaze. We didn’t wait for the dessert to cool. Instead I scooped up this dish into bowls and we ate it as cobbler. Lip smacking good! Now I will look into how to make vegan vanilla ice cream to go alongside and try this with other fruit (possibly peaches). Thank you for this great recipe! 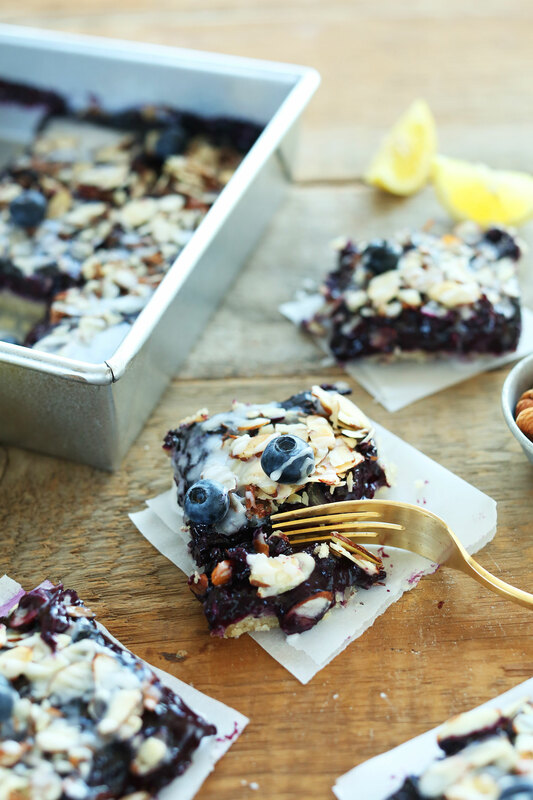 Your Almond lemon blueberry pie bars looks delicious. I’m excited to make some. I’m just wondering where to buy vegan butter? Is it available in stores? Most grocery stores carry it and Walmart. Try the natural foods section. Earth Balance brand, comes in sticks and tubs. It is! Almost all stores now. Especially health food stores! Wonderful recipe! I loved it! Just a quick note though- I called my mother-in-law to pick up some of the items from the store for this recipe and the “slivered almonds” she brought back were cut differently than the ones in your beautiful photos. I think perhaps your recipe includes “sliced almonds”. Anyway, everything else was perfect! Thanks for considering. Oh Dana….. where do I begin? Love how these are PACKED with blueberry goodness. And almonds. And lemon. Love that I can say you and I live in the same city. Now I’m dreaming about an oh-so-lucky synchronicitous moment in time when our paths might cross at a farmer’s market and I can jab my sweetie in the ribs and say, “Look! There’s the Minimalist Baker!” And I’ll let his ignorant reply of, “Who?” just slide because the poor man just isn’t in the know about these things. Keep up your awesomeness; its so appreciated! This sounds so intriguing and delicious. I am fan of BLUEBERRY and must try this soon!!! 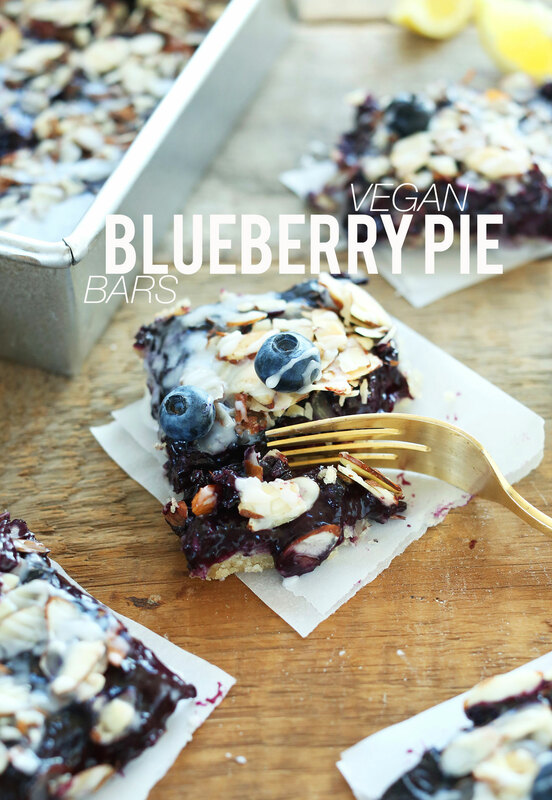 I love this..I love blue berry and this bar recipe is so easy and with so minimal ingredients.Can I use extra virgin olive oil in place of butter? I don’t think so, but try coconut oil! These look and sound delicious. I’d love you to share this in my #seasonalkitchen linky. These look absolutely stunning!! We tragically don’t get a lot of good blueberries over here, would frozen blueberries work here? Thank you for being such an amazing recipe developer your site is literally my favorite!! Thanks, Maria! And yes that’ll work! 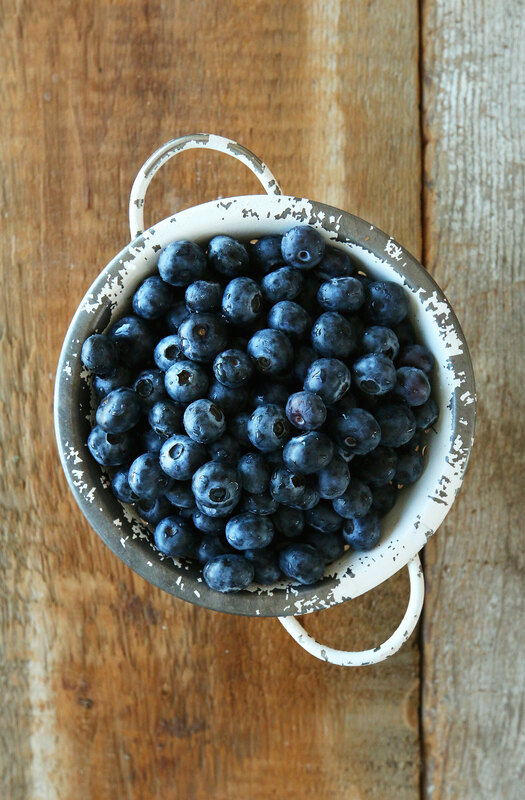 OMG Dana, that photo of a bowl of blueberries is one of the most GORGEOUS things I have ever seen. These look outstanding in the extreme! Aren’t blueberries something else? This looks amazing, from crust to icing. LOVE blueberries. Thanks so much, Dana! Can’t wait to make this version. I want to come over and eat one. Blueberries are my favorite fruit. I love your photos – I know I always tell you this! I have been making raw desserts lately – chocolate based – your post makes me want to make a blueberry one next. Thank you so much for the inspiration and awesome recipe! Any idea measurements to sub AP flour with coconut and or almond??? I need to go buy blueberries now. The crust sounds yummy! It’s like you read my mind! I guess we wouldn’t be true Oregonians if we didn’t have a few pints of blueberries kicking around needing to be baked into something delicious. Can’t wait to try this! Question, in the filling section you have butter and chia seeds as an optional add in.. Do you add those with the fruit when cooking or with the almonds and sprinkle those on top? Thank you! Looks so yummy! Add then to the fruit toward the end of cooking! Great work on the video Dana. I love this new feature and your and John’s constant push to make minimalist baker better and better. I need these lovely bars in my life!!! Thank goodness for the flat of blueberries in my freezer! These look so amazing Dana!! What a creative way to use fresh summer produce :) Just a question, could you sub the vegan butter for coconut oil? Someone did and said it worked beautifully, Sarah! Wow! These look divine. I’m incredibly impressed with how perfectly they slice too. That’s always a struggle for me- getting that perfect slice! 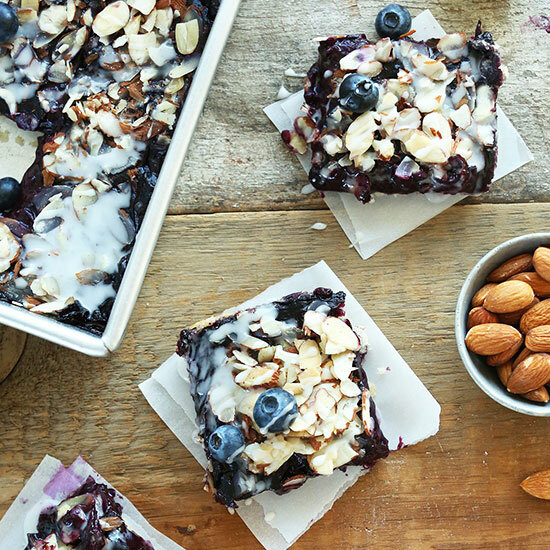 Now I want all the blueberries so I can make this gorgeous thing! These look amazing! Love the video! Wow, these look incredible! Especially since I have a ton of blueberries to use up! Thanks for the recipe! 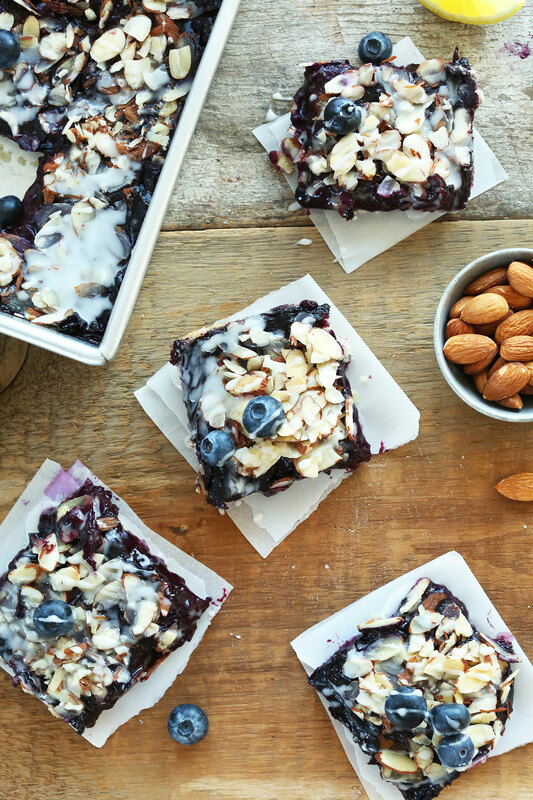 I’ve been gobbling up ALL the blueberries lately, so I really need to save a few cups for these! These bars have got to be the most blueberry packed bars our there!! YUM! Oh my! These are beautiful and look sooo delicious. I want to try this soon!! I have had a pint of blueberries in my fridge all week. Every. single. day. my sister asks if I’m going to use them and I keep saying “yes, I just don’t know on what yet.” This is FATE. YUM!! These look amazingggggg. I can’t do gluten, so I may try to make these and sub coconut and almond flour instead of AP to see if they work. I can’t resist – these scream summer and my mouth is watering at 8:30am! Have you tried it yet with subbing the AP flour?? I don’t use that either….almond or coconut, bug I’m not sure the quantity??? Please help if can….Thanks!